For Cass Art's 30th Birthday, we released a Limited Edition 30th Anniversary tote bag - cotton, black, and emblazoned with famous art icons. That's right: it's the 'Art in a Bag' bag, and it's back. We've had Scarlet Lake, Permanent Mauve, Quinacridone Magenta and Payne's Grey; Ultramarine Blue and Orange Lake Deep; Olive Green, Linden Green and so many others. 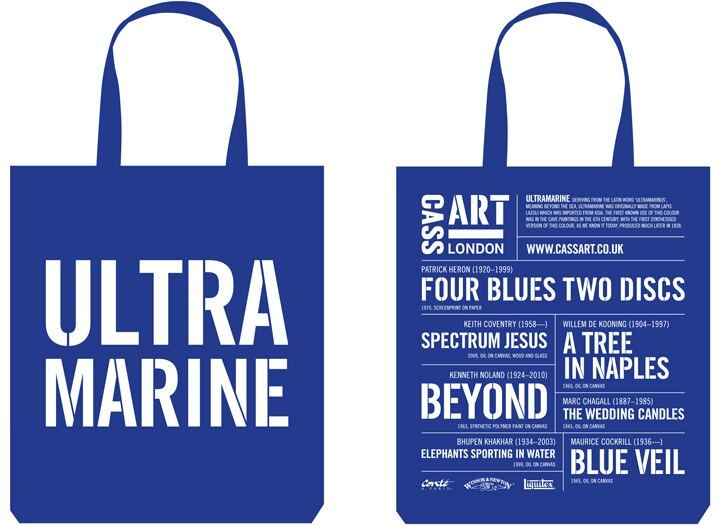 But it all began with the original 'Art in a Bag' tote, which launched in store in 2008, when Mark Cass, CEO and Founder of Cass Art, and Pentagram Designer Angus Hyland, got together to give customers a sustainable way of carrying their art supplies home. "We're in the colour business"
Over the years Cass Art has released 12 different coloured tote bags. Emblazoned with the colour names, the back of the bags then refer to the names of paintings that use that colour - for example, Ultra Marine blue was used in Kenneth Noland's Beyond. "This is Cass Art's own frame of reference and we wanted to highlight the colours that Picasso and Lichtenstein had used," says Mark. "We're not just in the world of graphics, but fashion - and we wanted to remind customers that at the heart of everything we're in the colour business." Mark and Angus had originally considered having just the artist's name on the bag, "but we wanted to flip it on its head and highlight the names of the pictures", says Mark. "Artists often obsess about the name as part of the creative process - and championing the art itself acknowledges this as part of the process alongside the use of the colour.". Do you love the Cass Art bags as much as we do? We want to see your pictures of the tote bags - your collections, your favourites, the places they've been, the art they've carried. Upload your photos to Twitter and Instagram with the hastags #CassArtbags #artinabag to share the love of colour. See all of Pentagram's design work for Cass Art on their website. Follow us on Twitter and Instagram and upload your Cass Art bag photographs with the hastags #CassArtbags #artinabag.